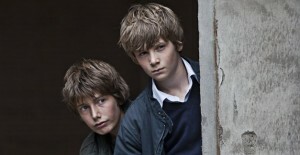 Markus Rygaard (l.) and William Johnk Nielsen look to the future in In a Better World. In a Better World, the winner of the 2011 Academy Award and Golden Globe for Best Foreign Language Film, was released on a two-disc Blu-ray/DVD Combo Pack on Aug. 30, 2011, from Sony Pictures Home Entertainment, priced at $45.99. The drama movie, directed by Susanne Bier (Things We Lost in the Fire), follows the contrasting lives of two boys, one who’s trying to discover how to live after his mother’s death, and another who’s getting bullied at school while he’s trying to deal with his parents, Anton (Mikael Persbrandt) and Marianne (Trine Dyrholm), separating at home. Meanwhile, Anton, a doctor, commutes between his home in an idyllic town in Denmark and his work at an African refugee camp. In these two very different worlds, he and the boys are faced with conflicts that lead them to difficult choices between revenge and forgiveness. The 2010 film received a limited release in theaters in the U.S. in April. Needless to say, the critics dug it!